Well I never.... what a pottymouth that seemingly innocent plate of food has!! Watch your ruddy mouth, food plate! My ears are not a toilet!! Oh errr wait, did they mean the colour blue? Oh this is embarrassing. 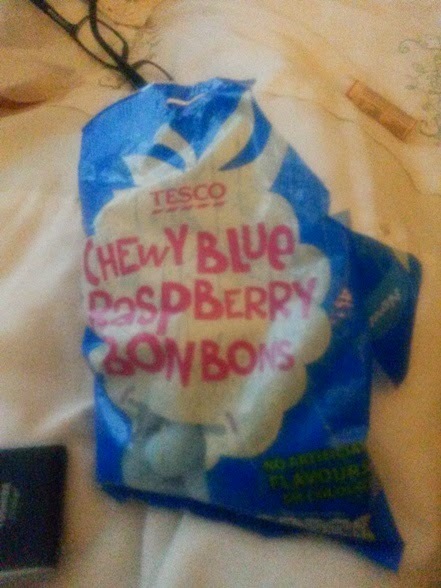 Um, well here - have a terribly lit picture of some blue bonbons instead! 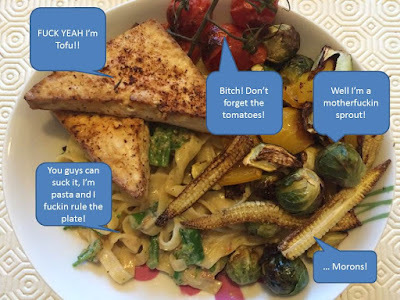 Haha, loving the plate of 'blue food'! OMG LMAO! Totally LOVED this post! Made my afternoon! Made me like your blog even more than I already do! Nice!!!! I need to find those bon bons! Haven't had them in years! You win best for blue!! This gave me teh lolz! I love how the baby corn wants nothing to do with the pottymouthed ingredients. Uppity baby corn!